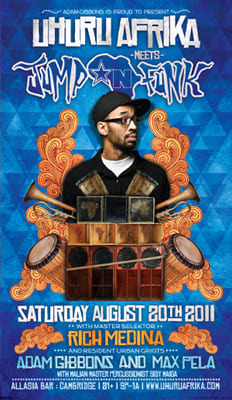 Last time I brought Jump N Funk to Boston we almost knocked down two walls at AllAsia Bar! We meet Uhuru Africa once again for another night of Global Afro Soul, Afrobeat, Afro House and Pan African grooves. Beantown, let&apos;s get busy! Love Afro Life! I did a party at Tammany Hall a few months ago, right after the tsunami in Japan. I had a great time for a great cause. Looking forward to rocking with DJ Soul and DJ GetLive as well. When one of the DJs that you looked up to your whole career calls you to sub for him at his party, you should show up. Francois K. is a pioneer, and one of the leaders in dance music culture. You may know him from Body & Soul and his productions, but Deep Space is his baby, and I’m thankful that he asked me to come participate. Installment #5 of my new Miami residency! One of my favorite new things to do! Hopefully if you&apos;re in Miami and you check us out, you&apos;ll feel the same. Last month was super heavy, rocking out ‘til 5 a.m., and we&apos;re only expecting more first Friday fireworks this coming month. Miami, let&apos;s get it! Installment #4 of my annual Fela Kuti vs. James Brown throwdown with my brother DJ Spinna. Each and every time we do this party it gets stronger, more full, and gains more recognition. Here&apos;s to you being a part of NYC Afrosoul history with us on September 3! I did the Lazy Afternoon party over Memorial Day weekend with these cats and had a ball. Now we are looking to make it a residency at least on a quarterly level, if not more often. I love bringing my sound to new markets, and if my last visit was any indication of what&apos;s to come, September 4 should be one for the record books, to say the least! Brooklyn Bowl is one of the most unique and ambitious venues in New York. To be brought in there as a DJ to rock such a big room on a monthly basis is an honor and a challenge that I welcome with open arms. As much as I trend toward smaller rooms, I really enjoy this party because I get to rock alongside my partner in crime, Mark Hines, who will rip your video guy&apos;s head off. Trust me. If you doubt it, come check us and see for yourself. I&apos;m beyond positive you will agree. BK let&apos;s go!